Throwing behind runners on the base paths can certainly be an incredibly effective tool for a catcher. We have the element of surprise on our side and can often catch a runner napping on the bases. This is one of the ways we can steal an out over the course of a game. However, in crucial situations like these (bases loaded, 0 outs), we must weigh the risks vs. the rewards. In this case, there were just far too many risks. It was still early in a close game and even if the throw was successful, we've only taken the runner off 1B with two runners in scoring position with one of the league's hottest hitters up to bat. That out may be valuable, sure. But it's not worth risking the result of what happened here. The second anything effects our throw, we have to shut it down. 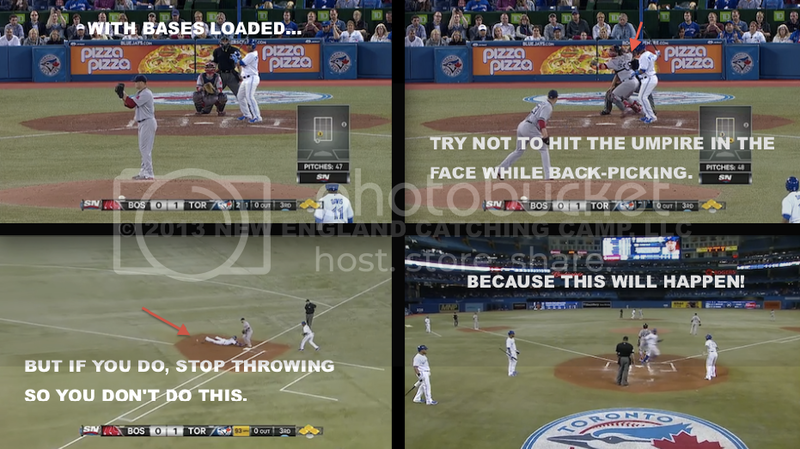 Jarrod Saltalamacchia almost knocked the mask off the umpire's head during the loading action of his throw, and the instant he felt it he should have stopped his motion. At the very worst the ball slips out of his hand and maybe, MAYBE, the runner from 3B has a chance to score. He decided to finish the throw and it instantly cost his team two runs while also putting the eventual third run of the inning in scoring position. Part of our job as catchers is to know when to pick our spots. We have the ability to to change the dynamic of a game with our arm, but we have to be smart first and foremost.